Is not easy finding the best backpack diaper bag isn’t it? The babies require the most things don't you think? That is why every time you leave the house with a baby, you must take so much with you. To haul your load, you need the best backpack bag to help you tote it. In order to help distribute the load and free up your arms and hands, a backpack diaper bag is a way to go. 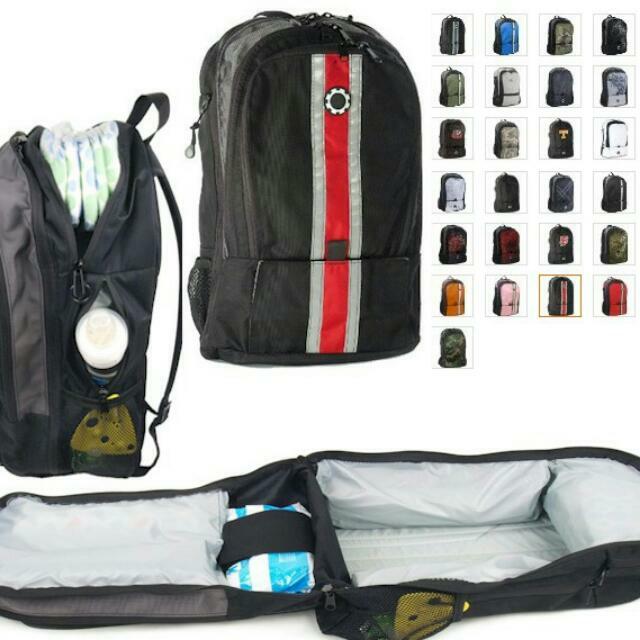 Many of the backpack diaper bags can also be toted in different ways, and there are several cheap and functional backpack diaper bags out there. But which is the best backpack diaper bag? Backpack diaper bags also come with different storage compartments and different options. You just need to find the right one to suit your needs. Let’s take a look at some of the most popular and best backpack diaper bag models on the market today. How To Chose The Best backpack diaper bag For You? 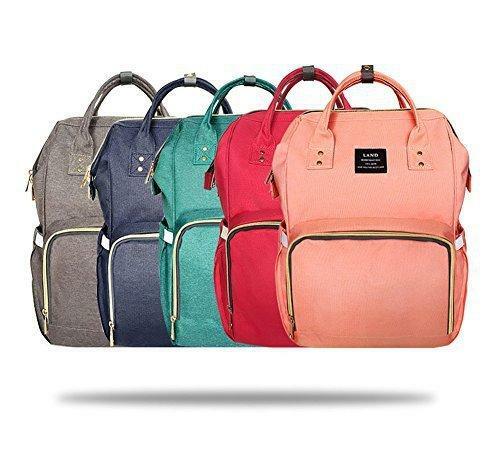 When choosing the best backpack diaper bag, opt for a backpack diaper bag that leaves your hands free, such as a backpack, sling, or messenger-style with a diagonal strap. Many backpack diaper bags can convert into a backpack style. Others are very simple "sling" styles that are great for quick trips. A backpack diaper bag that allows your torso to bear the brunt of the weight you're carrying is better for your neck and shoulders. With this type of bag, you won't have to balance your baby in one hand and a bag in the other. A hands-free bag will also make it easier to juggle a stroller and shopping bags while keeping up with an energetic toddler—that'll be your baby in no time—when you run errands. You can buy a bag designed to hang on your stroller's handlebar or clips that give you the same option with other bags, but we don't recommend this because the weight might cause the stroller to tip backward. More on that later when we present the best backpack diaper bags. The messenger-style bag (sometimes also referred to as sling style) has one strap and can be carried on a shoulder or across your chest. They are often designed with dads in mind, but you can find them in almost any variation, from unisex to floral. The messenger bag has an adjustable shoulder strap, is big enough to hold a laptop, and has plenty of pockets, including insulated ones for bottles. A tote-style looks like an overgrown handbag. 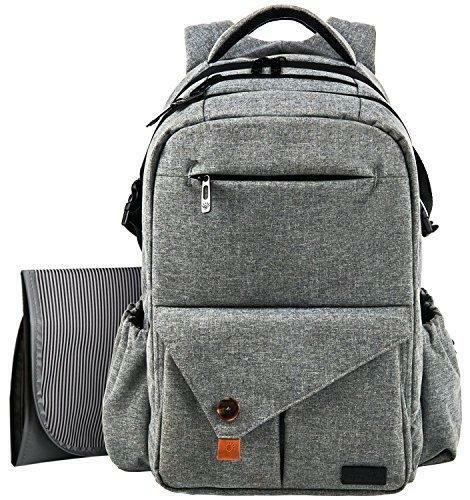 Like other bags, some include extra pockets and space for cell phones and more. Some tote styles, come with detachable straps so you can turn it into a backpack or messenger bag, or simply grab the tote handle on the top. Other tote styles look even more like large pocketbooks with large handles, just like a fashionable purse. Another variation sometimes called a "stroller diaper bag," is basically a tote-style but designed with longer straps to fit on the back of a stroller's handlebars. Models are available for double strollers as well as single. Some of these stroller bags have clips. Manufacturers are adding stroller strap-on mechanisms to other styles as well, and you can buy separate clips to fasten any bag to your stroller. Many parents prefer the convenience of a backpack diaper bag when it comes to hauling all the stuff their little one needs. 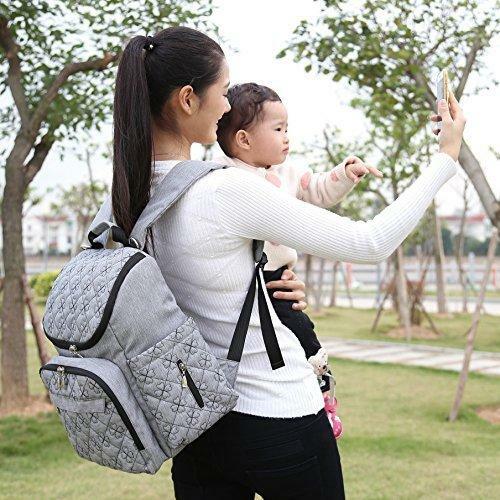 But beyond the hands-free factor, backpack diaper bags, with their padded straps, can be more comfortable to carry than convertible- or tote-style diaper bags, and can also be a more unisex option for moms and dads who want to share a bag. Plus, they're a perfect pick for families who travel a lot since you'll also have to handle a lot of other precious cargo as you zip through the airport. 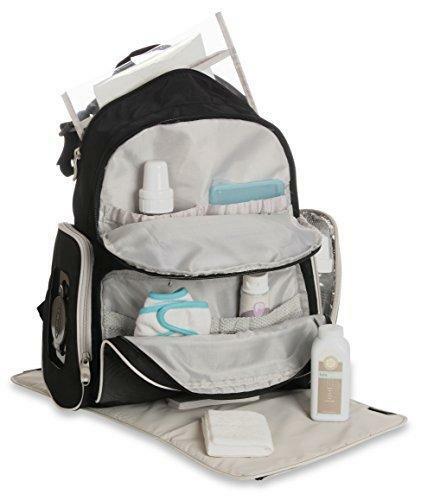 Nation Diaper Bag Backpack has more than 1700 reviews on Amazon! It also includes adjustable stroller straps, a changing pad, and a sundry bag. Fourteen pockets—including an insulated pocket large enough for multiple bottles and a dedicated wipes pocket for easy access during diaper changes—help keep everything organized, which is a must with a crying baby. A great backpack diaper bag don't you think? It comes in two shades of grey (lighter and darker shade of Grey) and it’s amazing. 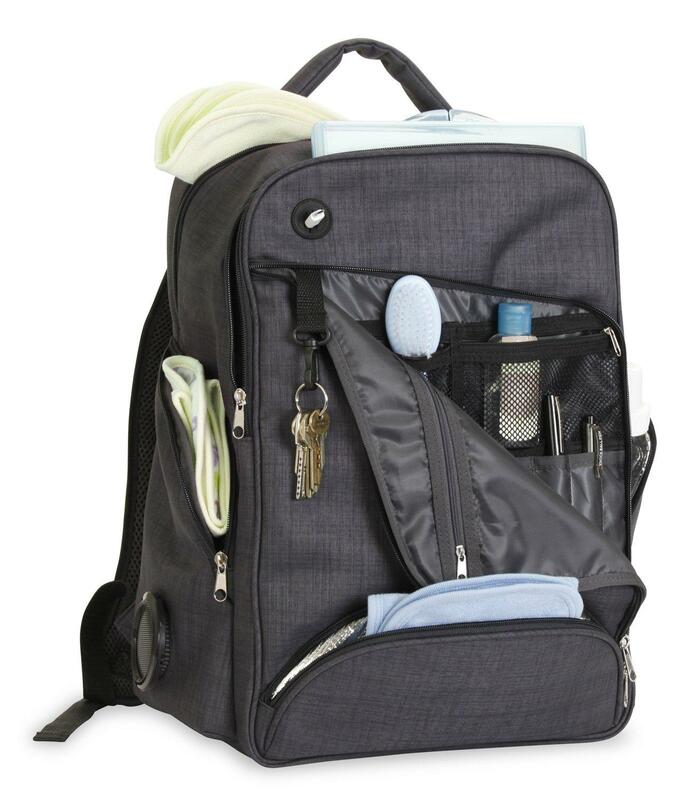 It also has a big diaper bag organizer with 18 internal & external pockets for endless organization options,2 big separated compartments allow you to organize all your supplies and your baby’s supplies with ease. For long-distance travel, it's the best choice. This backpack diaper bag is also waterproof, comfortable and practical. It has insulated bottle/sippy cups pockets store and keep the baby foods at perfect temperature for hours. The bag also has an easy-access zipper side pocket for baby wipes, and of course, a changing mat is included. Made of a lightweight, sturdy, waterproof oxford fabric, the Land series diaper bag has a large, easy-to-clean interior with multiple elastic pockets, an inside zippered pocket, and lots of space for all of your baby’s gear. A zippered, insulated front pocket is designed to hold several bottles; there’s also an additional large zippered pocket in the back, a zippered tech pocket, and a wet pocket. Plus, there’s an exterior wipes pocket. 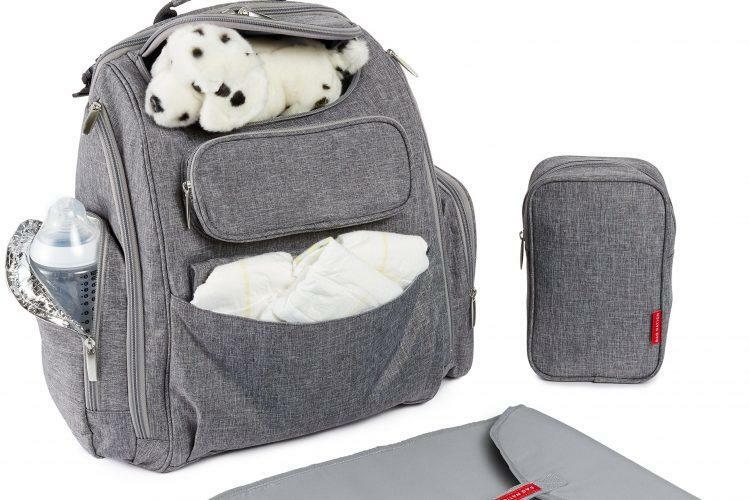 On the downside, this diaper bag backpack doesn't come with a changing pad, so you’ll need to provide your own. And this isn’t a convertible bag—there’s no shoulder strap, and no way to attach it to a stroller. This backpack diaper bag is most suited for twins! The interior pocket has multiple elasticized storage compartments and a zippered pocket for easy organizing, while the outside has multiple zippered compartments, an insulated bottle pocket, and an easy-access wipes pocket on the side. A changing pad is included. 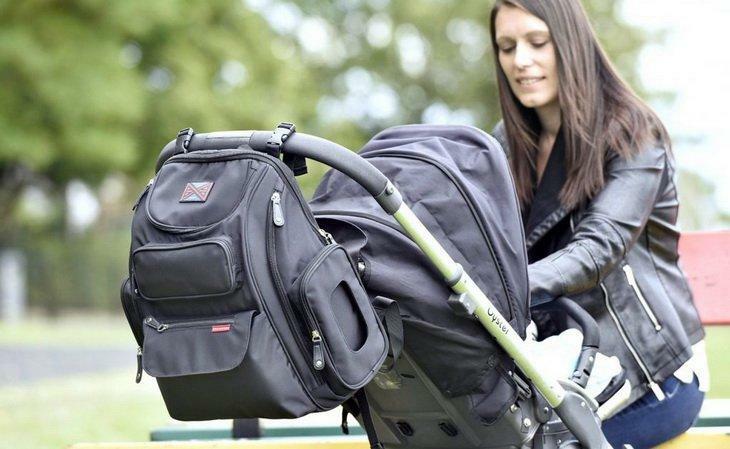 The biggest downside to this backpack diaper bag: it doesn’t attach to a stroller. High tech and functional backpack diaper bag! A 7800mAh power bank keeps up to four mobile devices fully charged, while an attached Bluetooth speaker lets you listen to your favorite tunes or podcast on the go. There’s also a cool integrated LED light so you can easily see and find everything that’s inside the bag. This sleek bag has all the functionality you need from a diaper bag—including 20 (20!) pockets; a spacious interior, insulated exterior pockets, a changing pad. DadGear’s bag has comfortable, adjustable, padded straps, and comes in 14 different color/pattern options. Thirteen pockets help keep baby gear organized, and convenient features include an easy-access wipes window, a “diaper hammock” that’s designed to keep diapers easily accessible and at the top of the bag, and a main zippered compartment that opens flat, suitcase-style. No surprise since the company is owned by two dads! 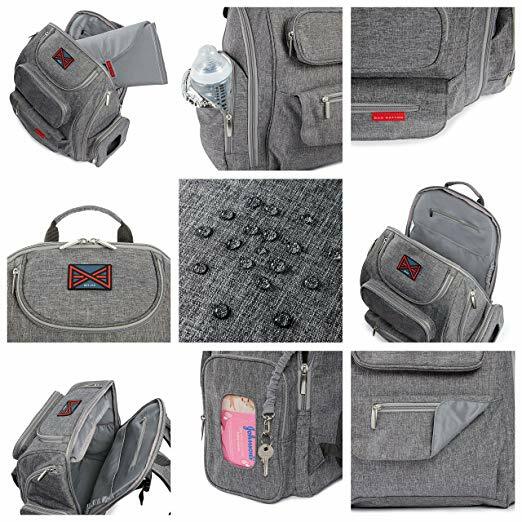 It’s made from durable, water-resistant nylon fabric; it has padded backing, adjustable buckles, and reinforced straps; and it’s super-roomy, with 14 organizer compartments (including two insulated side pockets for bottles and a dedicated wipes pocket) and a large inside storage capacity. Best of all, the Mancro diaper bag includes many of the parent-friendly features found with pricier bags—like an included changing pad and stroller straps—and one additional feature that we love: the bag’s main compartment unzips to lay completely flat, which makes packing (and finding!) baby gear a breeze.